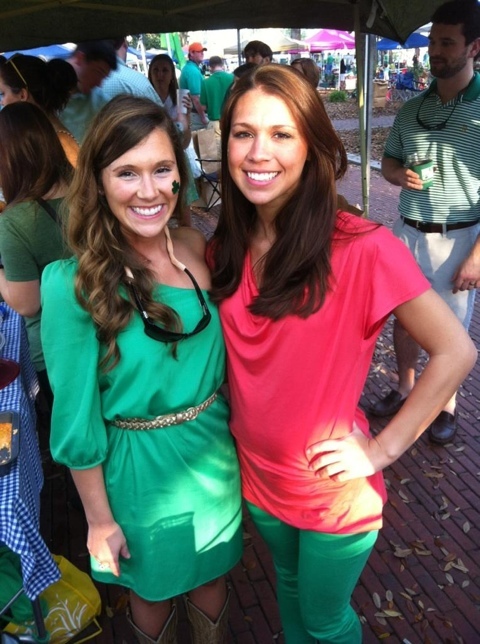 It seems like months that we’ve been preparing for the annual, Savannah St. Patrick’s Day celebration! With over 1 million people predicted to grace the streets of Savannah decked in obnoxious green attire, we knew we were in for an adventure. After a week filled with long nights, addressing wedding invitations and cleaning the apartment, I couldn’t have been more thrilled to greet my fiance, sister, JP, Marla, and Clark on Friday. (I had quite a few house guests for the weekend – in my 1 bedroom apartment I might add.) We spent Friday night making buffalo wing dip, chocolate chip and confetti cookies, and caramel cream dip for green apples. 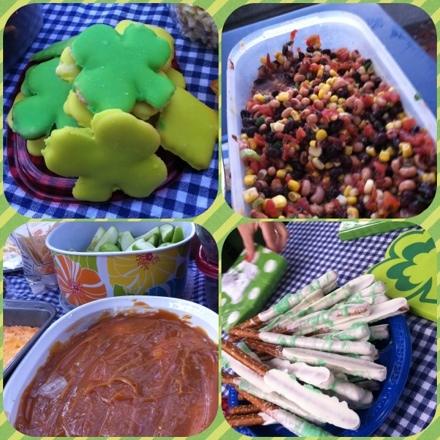 All were incredibly delicious and pinterest inspired! As the tradition goes, we pack up the car on the eve and rise early (as in 4 AM early) to beat the crowds. Friends gather in Chippewa Square with coolers, snacks, and tents – ready to camp out until the festivities are in full swing. Side note: we aren’t technically allowed in the square until 6 AM and the parade doesn’t actually start until 10:15 AM. Long morning. 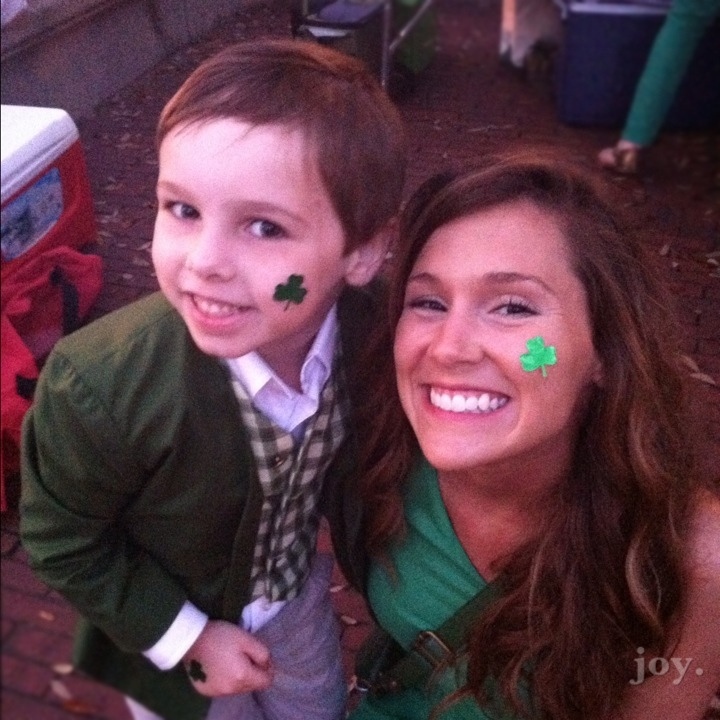 This little leprechaun was walking around greeting the ladies by saying, “Top o’ the mornin’ to ya” and passing out green, clover stickers. Lachlan is definitely the most handsome, Irish man I’ve ever encountered! By the time the parade reaches Chippewa Square, we are all pretty much exhausted. Did I mention that this infamous parade lasts approximately 3 1/2 hours? It’s 3 1/2 hours full of soldiers, loud sirens, clowns, pageant queens, and Irish dancers – and obnoxious bystanders. A sight to remember, for sure. 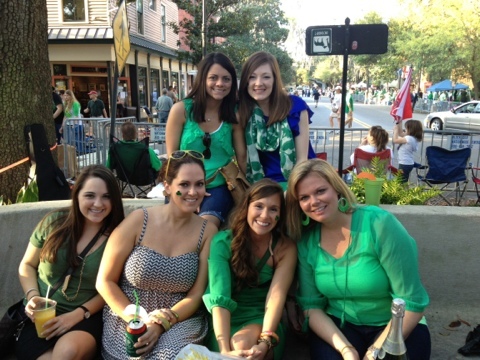 For locals, St. Patrick’s Day is the ultimate holiday and calls for an extreme celebration – rain, shine, or week day. 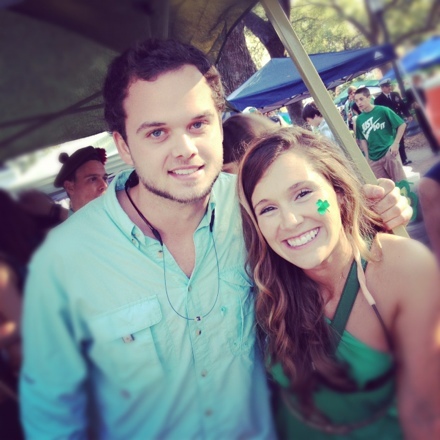 This year – with the combination of the holiday falling on a Saturday and having the most perfect weather – it’s been said that Savannah broke records, beating out New York City for the largest, St. Patrick’s Day celebration in America. After fighting the crowds and attempting to drive through downtown Savannah, I can attest that there were a lot of people in Savannah on March 17th. In my group, we had several first timers – including Bethany, JP, Marla, and Clark. Even though I tried to warn them of the chaos that the holiday entailed, I feel they were all a bit surprised. From 4 AM until 4 PM, we enjoyed the festivities – however, it was quite an exhausting outing. 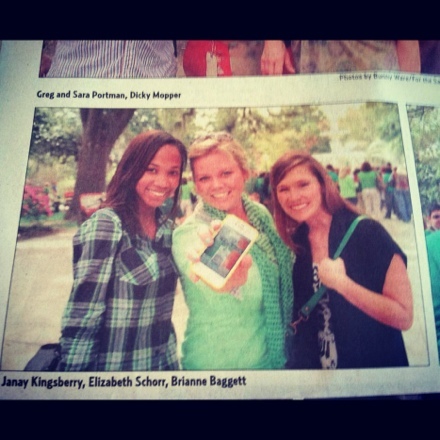 On the morning after, Liz and I were spotted in the Savannah Morning News Sunday paper supporting the St. Pat’s Guide app. 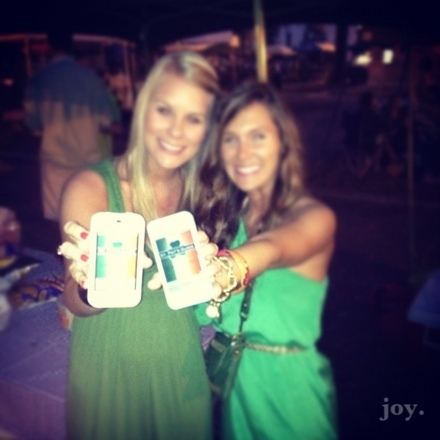 If you are in Savannah for future St. Patrick’s Day festivities, download the St. Pat’s Guide iPhone app. It’s free and provides a map of the parade route, calendar of events, and so much more. We ended the weekend by taking Bethany and JP to one of our favorite restaurants, The Distillery – for a crab cake sandwich, fish tacos, a tuna melt, a burger, and sweet potato fries. Talk about some good eats! 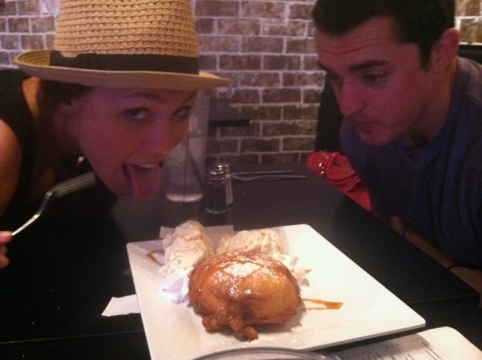 We completed our meal with The Distillery’s signature deep-fried Moon Pie. With full bellies, we sang our so longs and farewells – until we meet again. 27 Mar ’12 Filed under Family, Friends Forever, Savannah Adventures, Sisy Love. 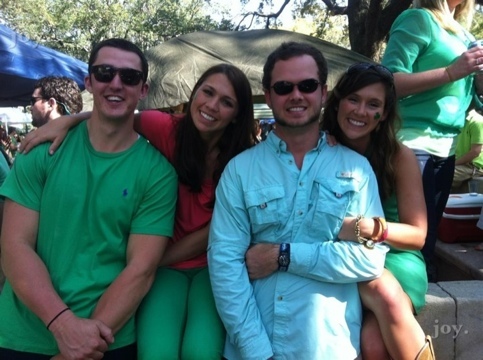 Tagged celebration, friends, green, Irish, Savannah, St. Patrick's Day. Bookmark the permalink. Post a comment. Leave a Trackback (URL). Justin and I tied the knot! It’s official, we are Mr. & Mrs. Heape. Wow you guys are brave waking up that early!!!!! We enjoyed the festivities but didn’t get down there until like 11am! But looks like yall had a great time!!!! Savannah really is crazy during this!!! hahaha. I live in Savannah. Yeah dying the fountain and river is cool but thsenoly unless you plan a trip just to get drunk it’s not worth it. This year we are estimated to have the number 1 celebration in the nation and have over 1 million people coming. On normal years we are the 3rd and it’s just a mad house. You can’t walk on the street your getting pushed and shoved and groped by drunk people. It smells, it’s hot, there are lines quarter mile long to get into a bar. Unless you go grab seats at 6 in the morning there is nowhere to sit for the parade, no parking at ALL downtown, you’ll have to park mid town and take a bus. Honestly you are far better coming to Savannah when we aren’t being represented by green drunks. It is a beautiful city best time to visit would be early spring or in fall, summer is just too hot. Plus all the azealeas bloom in spring and the city looks spectacular.